Using just the Galway Chunky, cast on 55 stitches. Add knit-a-long yarn, place marker and join being careful not to twist stitches. Work even in stockinette st. until piece measures 3”. Drop the knit-a-long yarn and continue on until piece measures 9” from cast on. Break yarn, thread through remaining stitches, pull tight, and fasten off. Knit 3-stitch I-cord for 40”. 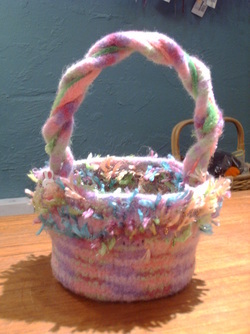 Felt basket and handle separately. Fold handle in half and twist - let dry that way. Form basket over plastic butter tub while drying. Sew twisted handle to edges of basket. Twist chenille stems or pipe cleaners into handles to stiffen. Embellish with animal or egg buttons.